It’s the most wonderful time of the year so we thought, what better time than to host a little Christmas competition. To help you get in the festive spirit (if you aren’t in it already!) we want to give you the chance to win a a Calvin Klein Downtown 50ml gift set which contains a 50ml bottle of the Eau de Toilette and a 100ml body lotion. 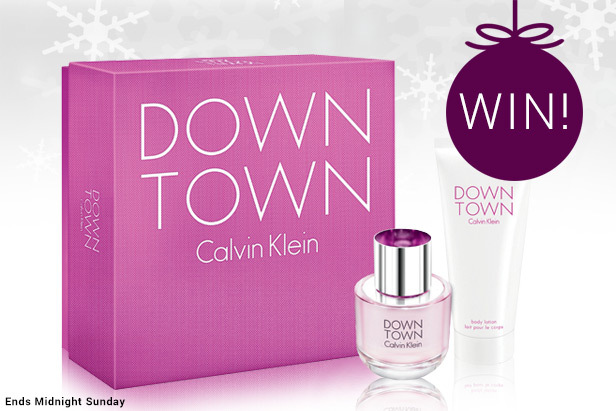 Downtown is the newest fragrance from Calvin Klein and is a lovely, feminine scent which can be worn every day. Downtown contains notes of Italian cedrat, bergamot, Tunisian neroil, green pear and watery plum. It’s a really sweet scent that is perfect for the ultimate girly girl. Now for the important part! All you need to do to enter is tell us what your favourite Christmas film is! It can be your favourite film from childhood, it can be old or current, it can be any film you want it to be! The more creative answers the better! Below is an example of Sophie, our merchandiser’s favourite Christmas film, to help give you an idea! We can’t wait to read all your entries and see what your favourite Christmas films are! The Calvin Klein Downtown Competition has now ended. Congratulations to Lesley Rawlinson who is the winner of the competition! Thank you to everyone who entered! Polar Express, such a magical film that puts the belief back in Santa. My favourite is Home Alone, you can’t help but love it! My Favourite Christmas film is Elf because when people loose the wonder of Christmas it become a chore instead of fun and this film reminds me that Christmas is magical at any age. My favourite Christmas film is Home Alone 2 because it reminds me of my childhood, I used to watch it every Christmas! OMG to easy ‘The Santa Clause’ I watch it anytime, not just at Christmas. Home Alone is my favourite. I didn’t see it until a couple of years ago but I can’t believe I went that long without it in my life! Has to be the traditional Christmas Carol starring the late Alistair Sim-the perfect, eccentricly batty Scrooge and a movie with the ultimate feel good factor. My favourite Christmas film is The Most Wonderful Time of the Year, the story of what happens when you open your heart to the power of Christmas. It’s an uplifting and laugh-packed story that will inspire the whole family to believe. I love it. Definitely Elf. Its so funny and you see his innocence, and seeing Christmas how children see Christmas. it really gets us in the Christmas mood and all giddy for Christmas day. And its the funniest film aswell! My favourite is Home Alone. We had a movie night with the kids and it was the first time they had seen it. The sound of their laughter alone makes you want to watch it over and over with them snuggled up on the sofa with a mug of hot chocolate! My favourite film is Home Alone 1 – Sheer comedy and mayhem from the start then Machaly Culkin being so brave, fending for himself after he was left Home alone,the comedy of how he fought off the robbers, the wonderful story of his next door neighbour falling out with his family and being reunited with them again and how it was such a great hapy ending eith his family in the end especially when his Mum walked in the door. Definitely National Lampoons Christmas Vacation, the Turkey collapsing has the same effect on me every time I watch it ! Brilliant ! Without a doubt it has to be A Christmas Carol. I would have usually said the original version but after watching the animated version with Jim Carrey, it is fabulous too! I love the morals behind the story which depict the true meaning of Christmas. It’s our daughter’s first Christmas this year and watching this together will now be one of our family traditions! My favorite film is the anime film ” the nutscrackers”, is definitively the movie of christmas! Favourite Christmas film is Love Actually. Love, romance, optimism and tenderness!Love, romance, optimism and tenderness! My all time favourite Christmas film is Home Alone, I know its a total cheese fest but I stil laugh and I still wish I was that kid! My favourite christmas film has to be Beauty and the Beast: The Enchanted Christmas. Beauty and the Beast is my all time favourite film anyway, and the christmas theme makes it so much more romantic. Plus the characters of Lumiere and Cogsworth never fail to make me laugh! It brings back childhood memories of Christmas, and is definitely a film for the entire family! my favorite film is Elf, it puts me in the mood for Christmas and I always feel emotional at the end when they start singing, why I dont know! My favourite is Love actually. Why? Because I find myself in some of the movie scenes. Love actually happened to me when my life was not what I was wanted to be. The best Christmas film is Elf, it makes me feel so festive, I love nothing more than sitting down to watch it, with a cuppa and a chocolate digestive. Buddy is beyond adorable, and I love his childish ways, I wish I could be so positive, and have the optimism he displays. His laughter is infectious, you can’t help but join in, and Jovie is such a sweetheart, it warms my heart when their love begins. I’ve already watched Elf this year, more than a couple of times, I love it more than ever, bring on the Christmas cheer! I have so many favourite Christmas films, but is got to be Santa Claus the Movie, the one where Dudley Moore is the Elf and he works for the bad guy and creates Candy that makes you fly. This always gets me in the mood for xmas, sitting in front of the TV watching the film and wrapping up Xmas Presents. my favorite film is Elf, it puts me in the mood for Christmas and I always get emotional at the end when they all start singing, why I dont know. I love the golden oldie ‘ITS A WONDERFUL LIFE’…a truly magical film and makes me cry everytime! I love to watch the Lord of the Rings saga. Despite they are not really Christmas-time films, I always remember that warm feeling to be 3 hours with family with the fireplace nearby! My favourite Christmas Film is Elf. Having seen this many times I love it more and more! Its magical, funny and encaptures the whole Christmas spirit. Definitely a film for all ages! Home Alone,Never get tired of seeing it,so funny. Miracle on 34th Street the true magic of Christmas seen through Susan’s eyes when she realises there really is a Santa Claus. My all time fav Christmas film is Home Alone. Don’t ask me why ! My favourite is The Wizard of Oz because it reminds me of my childhood, it always seemed to be on every Christmas so it’s one of those films that, amongst others, I think of and associate with christmas. I Love the film the Great Escape its on every christmas, I love the Cooler King, Steve McQueen I think hes gorgous shame he died when he did. Think of all the movies he would have made. My favourite Christmas movie is A Christmas Carol. I love the end when scrooge changes his attitude and decides to enjoy Christmas. My favourite Christmas film is Mrs Miracle. I only saw it for the first time last year – it’s twee and cheesy and everything that an american Christmas film should be. It’s about 2 little boys who live with their father after the loss of their mother. Mrs Miracle arrives as a nanny to bring the spirit of Christmas back to the family. Needless to say she also ensures that a lovely single girl meets the dad and they all live happily ever after. My favourite Christmas film is Bugsy Malone. Its a great feelgood movie and I love singing along. The end scene always makes me want to join in and get messy. Has to be Home Alone, something for everyone, my kids just loved it, and we would all sit down to watch together. It manages to combine slapstick and sentimental without too much of either! I love national lampoons christmas vacation, its funny and sad, when they put the lights all over the house and they eventually light up, and you can see them from space. The squirrel in the tree, ooooo cant wait to watch it. My favourite Christmas film is actually “Love Actually”. Perfect viewing for a cosy night in by the fire, fairy lights on, glass of mulled wine and sit back and enjoy the stories of love and life all intertwined. Cheesey I know but everyone loves a bit of cheese at Christmas! White Christmas as it’s what I watched as a child…..it is jut definitive Christmas for me. It’s A Wonderful Life because it really is! My all time favourite has to be ‘Scrooge’ best ever classic Chrismas film . Scrooged with Bill Murray – always a Christmas favorite. My favourite Christmas film is The Muppet Christmas Carol because I loved the Muppets as a kid and now as an adult they are just as funny. Anything that takes you back to Christmases as a child is a good thing, as that’s when they were most exciting! Santa claus the movie it captures the very essence of christmas. To be watched on christmas eve, thats what i call christmas. My absolute favourite is It’s A Wonderful Life, I watch it with my family every Christmas. My favourite is Home Alone-2. My Favourite film is It’s A Wonderful Life, no matter what has happened throughout the year, this always makes me feel good watching it. The best part is when the bell rings and George Bailleys daughter says the classic phrase. “Everytime a bell rings an angel gets their wings” I love the film so much i proposed to my girlfriend after wathcing it last year! I love Elf, it’s become a bit of a tradition to watch it on the first weekend of December (and again a few more times if it’s on telly!) I can practically recite it word for word, but that doesn’t make it any less brilliant. My favourite scene is “Santa’s coming! Santa!” And how I wish I could spend a Christmas in his North Pole with the narwhals and Candy Cane Forest. It’s a Wonderful Life. Classic with a happy ending. My favourites are Home Alone 1 & 2. I just love how inventive and clever one young boy can be, the story line is so crazy and you definitely go from thinking what sort of parents could leave their child behind to actually feel really bad for them. But then you don’t feel so bad when you see all of the things he gets up to. It’s got to be the home alone box set, absolutely love them! Home alone! All my childhood memories come to live while watching the film! I love the original Die Hard movie – festive frolics aplenty as Hans Gruber/Alan Rickman comically tries to outwit our hero John McClane/Bruce Willis – what could be more Christmassy? “Now I have a machine gun. Ho Ho Ho.” Perfect Christmas viewing IMO! Fave film is White Christmas especially bit where it finally snows in Vermont, soo lucky, not like us Brits! I love the grinch and as get nearer to Christmas our favourite saying is tick tick counting down the Christmas clock. My children are 16 and 15 and and we still say it. I live muppets Christmas Carol. It’s a must for Christmas eve. Mine is “Bad Santa”. This film is for grown ups (quite a lot of bad language), but the relationship between the boy and “Billy Bob Thornton”, is Hilarious. I know that Love actually is going to be very popular here, but it’s a brilliant and funny movie, with ups and downs, but all in Christma spirit and cheer 🙂 Timeless! My favourite christmas film has to be The Polar Express, it is the one film that guarentees to put me in the Christmas mood every year. I love Tom Hanks’ charector, the conductor- he’s so friendly and lovely. I can’t wait to snuggle up with my little boy this year and watch it! My favourite Christmas movie is definitely I’ll be home for Christmas! It’s funny and heartwarming and always puts me in a great mood. The Muppets Christmas Carol is, in my opinion, brilliant. seeing Michael Caine acting, and singing and dancing, with the muppets is delightful, along with the zany Muppets humour. White Christmas – always gets me when it snows at the end! My favourite Christmas film is The Little Match Girl’ – I remember it from a child, and it’s just stuck with me how cold she was and I wished I could find her and invite her into my home which was lovely and warm. my favorite holiday movie would be holiday because the lady is suppose to be dieing and thinks its her last holiday but finds out she isnt really dieing..very heartfelt movie..
My favourite is Wonderful Life.I love it! HOME ALONE. I used to live in the States and love this film. It takes me back to my childhood. It’s such a comical and heart warming film. My favourite Christmas film is Home Alone. I watch it every December & always will. Not only does it always make me laugh out loud but it makes me feel full of the festive spirit. My favourite part is when Kevin puts the tarantula on Marv’s face & Marv screams. I’m laughing now just thinking about it. It feels like Christmas when I watch this film. A Christmas Carol – the Alistair Sim version. My favourite film is love actually. This was at the cinema when me and my husband went on our first date. Every year I watch this to wrap my presents! My favourite Christmas film has to be Miracle on 34th Street. A wonderful Christmassy film for all the family that gets you in the mood for the festive season. A Christmas Carol – a beautiful, classic Christmas story, which has at its heart, the message that it is never too late to change. It reminds us what Christmas is all about – kindness, generosity, love and compassion. No matter how awful the world can seem, everyone has the capacity to become a kinder person. This film warms bot the heart and the soul and I make sure that I watch every Christmas without fail. I love Elf…. Oh it makes me feel so christmassy and always makes me cry then feel all happy again. It really means its christmas when I have seen ELf….. oh going off to watch the DVD now!!! A wonderful life, just a timeless classic for all ages. ELF – because it was the first Christmas film we all saw in the cinema. It was a cold crisp December day & it was magical. My favourite Christmas film is Santa Claus the movie. I can remember my parents taking me and my sister to watch it at the cinema when it came out. I was young enought o still believe in father Christmas and was totally overwhelmed by it. To make things even better it had been snowing while we were in the cinema and came out to everywhere absolutely covered. My mum told me father Christmas had arranged it specially for me and my sister. Best Christmas ever! My favourite Christmas film is A Christmas Carol. It doesn’t matter which version of the film I watch (and there are many), as this is such a classic story that it can be watched and enjoyed by children and people of all ages, It’s message is simple and embodies the true meaning of loving and giving – of how much poorer we are when devoid of these things and how much richer we become when we encompass the true meaning of Christmas, as depicted by Scrooge, in this wonderful Dickensian moral tale of Christmastide. I look forward to watching it again, this Christmas. my favourite is The Lion, The Witch and the Wardrobe – ancient but I still love being taken into the magical world of Narnia. Still get scared of the Ice Queen! For me it has to be Home Alone, it was the first VHS I got for Christmas so that made it special. It’s a great film, Macaulay Culkin is so cute in it. It’s a film full of fun and happy sadness….if that makes any sense. Love it when he and his mum reunite always brings a tear to my eye. It has always been Miracle on 34th Street. I can remember watching the original version as a child, but still like the newer version as well. I love watching ice age with the kids after all the cooking is done! I love Home Alone, it is as funny now as when I first watched it many years ago. My favourite Christmas film is Santa Claus The Movie as its one of the first films I watched at the cinema as a kid. Its got to be Muppet Christmas Carol – Kermit and Michael Caine at their all time best! Elf for sure! Thats the funniest for sure! My favorite Christmas Film is A Christmas Story, I grew up watching it every year because it was the perfect mixture of comedy and awkwardness, the leg lamp, the flag pole tongue incident and the trip to see Santa make this a classic that never gets old and now every single year I watch it with my kids. Die Hard, full of festive action! Bad santa so funny always cheers me up. My favourite Christmas film is Elf. I think Will Ferrell is hilarious and plays the part brilliantly. It still has me in hysterics even though I’ve watched it many times. I love the part where they get Santa’s sleigh back in the air by the power of Christmas spirit. So….I’m hoping that if I can summon up all of my Christmas spirit, that this prize will be winging it’s way to my door! my favorite are the home alone movies i just love those kids and how they tackle bad people and that movies give me all festive feelings! charlie and the chocolate factory, it reminds me when I was a kid and my mom was with me. Everything was magical. has to be Shrek. My children bought it for me years ago and we all sit and watch it on Christmas day. My favourite Christmas film is The Most Wonderful Time of the Year love it!! Jingle all the way, my Dad took me to see it at the Cinema 17 years ago and I still watch it every year! My favourite Christmas film is Home alone. It is featured in time of Christmas and it is just hilarious . I have seen this film a dozen of time. Home Alone in New York. I have many film favourites, but I’m going to choose White Christmas with Bing Crosby and Danny Kaye. Great songs, great cast, and a true feel good movie. A Tree Grows in Brooklyn. The part where the two little hard-up can keep a Christmas Tree if they can hold it when it’s thrown to them is a real tear jerker. Lovelyold film. I love ‘A Christmas Story’ an older film about a little boy who just wanted a gun for christmas, a heartwarming & childhood classic. AFTER CHRISTMAS LUNCH WE SETTLE DOWN AND WATCH MAMA MIA. I DEFY ANYONE TO GO TO NOD OFF DURING THAT. IT IS SO FULL OF LIFE AND ENTHUSIASM AND THE CAST CLEARLY HAD A BALL – IT’S JUST PERFECT VIEWING. AFTER CHRISTMAS LUNCH WE ALL SETTLE DOWN TO WATCH “MAMA MIA” I DON’T THINK ANYONE COULD NOD OFF DURING THIS. THE WHOLE CAST ARE CLEARLY HAVING A BALL – JUST PERFECT. my favourite film is Home Alone really love watching this & never tire of it even though i have watched it hundreds of times. Arthur Christmas, its just Fab!!! I’m a true believe in tradition and all things Christmas. My favourite Christmas movie has to be Scrooge. I have enjoyed it continuously since I was a child, back then the Ghosts of Past, Present and Future terrified me! Tiny Tim and his family melted my heart and this film really brings home the true meaning of Christmas time. Care, share and love. It’s not about greed and selfishness its about giving and loving. There have been many remakes but the original Scrooge is still the best. I always shed a tear. It has to be A Muppets Christmas Carol. Gonzo as Dickens, Kermit and Piggy as the Crachetts. Priceless and very funny. my favourite film is 2!! a christmas carol, and oliver. i have to watch them all! even the hollywood that only losely follow the christmas carol. its not xmas until i have watched at least one. Love Acctually lovely chritmas feel. There are lots of good Christmas films but only one great one – It’s A Wonderful Life. It may be old. It may be in Black & White. But the story of s desperate man who eventually realises that no problem is too great as long as he has the love and support family and friends is just so true especially in these times. It still brings a tear to my eyes every Christmas and has done for so many years. A reminder what Christmas is all about – family and friends. Just superb! It has to be the 2009 version of A Christmas Carol for its fantastic 3D animation. My favourite Christmas film has to be the Muppets christmas carol, full of singing and dancing, and wonderful artistry, all of which is led by the wonderful Kermit the frog and the diva of all divas, miss piggy. Jim Henson version of Scrooge is a lighthearted yet timely reminder of the true meaning behind the season festivities, goodwill to all men regardless of ones wealth, class, power, and previous misdemeanours, all of which for one day can be casted aside in the true spirit of Christmas – love, hope and peace on earth to all of those who wish it so. I love all the films ,,Home Alone ” because I used to watch it whit my family when I was a child and it remembers me of them when I am home alone for Christmas and I can go to them because they’re in another country.And I also love this movies because of that incredible courageous kid that puts traps for the burglars. My all time Christmas favourite films are all the movies Home Alone because I used to watch it whit my family each year and it reminds me of them each Christmas when I am home alone and I can be whit them because they’re in another country :(.And I also like it ’cause of that incredible courageous kid that puts traps for the burglars . My all time favourite christmas film is home alone – how adorable is kevin! I lobe the big house and the snowa and the soundtrack is so festive. love it. My fave film is “Groundhog Day”, not an out and out Christmas film, but all the snow makes me feel Christmassy, and Bill Murray is just ace. Snow and romance, what a combination!! my favourite christmas film has to be the grinch! i have watched it every year at christmas since i was little, no matter how old i am, it is an all time favourite! it is hilarious and jim carrey was the perfect actor for the grinch, amazing! My fave film is Groundhog Day, not a definitive Christmas film, but the snow and the romance and Bill Murray, makes me feel Christmassy! My favourite Christmas film that me and my family watch EVERY year is The Snowman-it’s not a blockbuster but it’s gorgeous, the animation is beautiful and the music just perfect. It’s quite funny too when the Snowman is trying on the boy’s mum’s clothes and different fruits for a nose! It never fails to give me a lump in my throat and a tear in my eye when the little boy comes downstairs to find his snowman melted on Christmas morning. It’s perhaps not very in the Christmas spirit but it serves as a reminder to have fun while you can because not everything lasts forever. “the wizard of oz” every xmas with my brothers and sisters while my mum got all her xmas stuff done. singing all the songs.I want to do it again. My favourite Christmas film is Miracle on 34th Street – I’ve always coveted the catalogue house that they move into at the end! my favourite xmas film has got to be home alone its the typical classic that all ages can watch :)gets me in the Christmas mood! Santa Claus the movie, always gets me in the festive spirit! ‘Elf is my favourite film- it shows all the excitement of Christmas that we have lost as we have got older – or that most of us have lost… Ho ho ho !!! I love Home Alone – it’s not Christmas without it! I LOVE National Lampoons Christmas Vacation – lots of belly laughs, but ultimately a good time had by all, despite the usual Christmas shannanigans. It has to be Jack Frost as it gives me that glimmer that my late Dad would come back to life in other ways. Gremlins! It’s actually quite dark in places – especially the stuff about the evil bank owner! I love Deck the Halls … even though everybody else thinks its naff!! The Muppet Christmas Carol, love that film. My favourite film is ELF – Everybody’s Laugh out loud Film. The Holiday has got to be my all time xmas favourite. A fantastic storyline with the perfect ending and a little bit of romance, perfect. National Lampoons Christmas Vacation is a big favourite with my whole family. It has to be ‘The Sound of Music’ … the perfect excuse to put your feet up … and have a snooze! Got to be ‘The Santa Clause’ for me. As a child I really wanted one of those ‘puce’ lollipops to fly around! Miracle on 34th Street always gets me in the mood. Elf is my fave – makes me n the kids chuckle. This is so embarrassing but Jingle All The Way, Arnie is brilliant in it, I love every time he says Turbo Man. My favourite film is the one that is shown on the BBC on Christmas Day afternoon. The whole family sits down to watch it & have a few choccies (and maybe a nap!) but it’s always lovely down-time for us all after the excitement of the morning! My favourite film is Starman with Jeff Bridges Sci-fi Romcom which I first saw at Christmas and so it revokes Xmas memories for me. HOME ALONE is my favourite Christmas film, sometimes I wish I had bee left home alone when the chaos of Christmas is in full swing, then I remember how much I would miss my family! Has got to be Elf – a fab family film, second only to Santa Claus the movie, I’ve loved that since i was a kid! My personal favourite is A Christmas Carol, but you can’t beat Home Alone 1 for family entertainment. The kids love it! ANy James Bond movie. Classic Xmas watching. My favourite Christmas film has to be Miracle on 34th Street. Jingle All The Way. I watched it a lot when I was younger, so it reminds me of good memories! The Snowman by Raymond Briggs – Animation at it’s finest. A wordless story about a boy that builds a snowman and goes on a Christmas adventure in his dreams. The Muppets Christmas Carol – love it as much now (aged 41) as I did when I first saw it in 1992! The Wizard of Oz – I want to live to see it 100 times! My favourite film is without a doubt ‘It’s a wonderful life!’. My gran let me borrow it one year, and as well as showing the true spirit of Christmas, it allows us to see how truly important we all are. A classic! Love It’s a Wonderful life – great film! Scrooge. It is such a feel good film. Makes me cry every time. Nightmare Before Christmas – Jack Skellington is my hero!! My favourite is definitely Home Alone. It’s tradition for our family to watch it every year and no matter how many times we’ve seen it we still laugh out loud! My favourite film is Elf! It has me in stitches (and tears at the end) every year – I love it! Jack Frost – Kevin Costner one it always makes me sob when he dies awwwwww! My favorite christmas film is Home Alone, I can laugh at it every time I watch it, such a clever boy, giving the baddies what for… my favourite part was the blow up doll in the shower… so funny. Elf, it makes me laugh every time I watch it and I watch it alot at Christmas. It’s a wonderful life reminds me of Christmases with my grandmother. It was her favourite film and so it’s mine too. National lampoons Christmas Vacation. only because its always on and the years rolling by remind me of watching back as an 80s kid, 90s teen and now as an adult. Nostalgic reasons I suppose?! My favourite Christmas film is the snowman… I’m all grown up now but when I watch that film I turn into an excited child again…Magical film! It has to be Polar Express. It makes you feel like a little child again. I just love Scrooge. I have to watch it on Christmas eve and it makes Christmas for me. Has to be Love Actually. My daughter and I have a tradition of watching it together every year. I wouldn’t dare watch it without her! I would have said a classic by British Television terms but I’m going to now say “Dinner for One”, written by a Brit but loved by the Germans, various Nordic countries and even Australia. So I think we should be making it a Christmas tradition here too even though it is quite short! White Christmas- A classic I’ve watched it too many times to count. I’ve watched it with my Grandparents, my parents and plan to watch it with my niece and nephew this year. White Christmas- A classic I’ve watched it too many times to count. Muppets christmas carol, really is sweet lighthearted funny and a good watch for young and old! My fave Christmas film is the original cartoon version of The Grinch. I always used to watch it as a child and now I am an adult it still has good memories for me. You cannot beat it! I absolutely love Arthur Christmas! I watched it for the first time last year and it immediately became my favourite Xmas film 🙂 It’s got the feel-good factor, is great for all the family and is a real giggle! The timless classic, White Christmas! Miracle on 34th Street always gets me in the christmas mood, but I also love all the old films like On Moonlight Bay and Meet me in St Louis, not strictly themed around Christmas but they make me all cozy, especially when the decorations are up!! I love Elf – its so funny and you cant help but love him. My favourite bit is when he sees the santa in the department store and says your not santa. I also love when he uses his dads furniture and chops it up to make things! My favourite film has always been, national lampoons Christmas vacation because, well, nobody’s Christmas is perfect and this shows that. All kinds go wrong but at the end of the day, it all turns out great!! Santa claus 1,2,3.i love how he changed to santa and how he loves hot chocolate, my children always have to have hot chocolate and marshmellows when they watch it. It has to be HOME ALONE I watch this movie religiously every year. I used to watch it when I was a kid with my parents now I watch it with my son. It’s just not Christmas without Home Alone! My favourite Christmas film is ‘A Christmas Carol’. I love both versions (new & old). It is not Christmas without it. My favourite Christmas movie is TradingPlaces with Eddie Murphy and Dan Aykroyd!! I see it at least 10-12 times each year, it always makes laugh out loud and Jamie Lee Curtis is a amazing as well! santa claus the movie,so many great memories of growing up. The film that gets me in the Christmas spirit is: coming home for Christmas. It’s such a tearful but extremely exciting movie, that touched me and my families heart even though it’s quite a new film for 2013. I could watch this movie again and again without getting the slightest bit bored. santa claus the movie brings back so many happy memories of growing up. I love Miracle on 34th Street – not the original though, I really like the remake. I just think Richard (brother of David) Attenborough makes a brilliant Santa! You just kniw that hid Kris Kringle really is Santa all the eay through! I love Elf – it’s such fun for all the family to get into the Christmas mood with. The film that gets me in the Christmas spirit is: coming home for christmas. It’s such a tearful movie that has touched me and my family even though its a new film and has just been released in 2013. I would recommend this movie to anyone it’s perfect for all the family. A christmas Carol, I love the transformation of ebeneezer scrooge,the original feel good story. Elf is just tooooo funny but I love home alone 2, got to love New York at Christmas!! Has to be Home Alone, watch it every year! I love watching A muppets Christmas carole as it really gets me in hte mood. My favourite Christmas film has got to be It’s a wonderful life. It is quite simply a truly insirational and heartwarming film that shows everyone never to give up on life. By showing waht would happen if you never exsted It completely warms the heart and makes them feel like an essential cog in the wheel of life. Outstanding movie. It’s A Wonderful Life – such an uplifting movie! My favourite christmas film is Home Alone. It is such a christmassy film with all christmas songs in and all the trees and decorations. It is always on tv at Christmas and my kids love it as do I. Great family film that gets you in the mood for the festivities. Has to be “it’s a wonderful life”, makes me smile every time without fail. For me it has to be Miracle on 34th Street for a feel good, weepy every time and well acted presentation. It’s A Beautiful Life – It just IS Christmas! I Love the Home Alone FIlms. My Kids crack up at the same things that made me laugh when I first watched them. Its a great set of Family movies. ELF!! it is so funny and so Christmassy! I love the Wizard of Oz. Its not Christmassy, but is always on over Xmas. I know it word for word and cry every time at the words ‘Oh Aunty Em, there’s no place like home’. My favourite Christmas film is love actually as whilst it’s sad it makes you rolle and who doesn’t like Colin. Hugh and Alan! Elf, love it, its so funny! Santa Claus the movie, watch it every Christmas Eve with my children! My favourite Christmas film is The Santa Claus..especially the end when the elves and neighbourhood kids watch and wave at Santa knowing he really exists! Charlie and the chocolate factory, reminds me of being a child and i was mesmerised by the huge sweets in the film. Has to be the Snowman every time:) ticks all my boxes. A Christmas Carol – bah humbug and all that! Has to be Scrooge. Classic Christmas. Santa Claus The Movie just sums up my childhood Christmases. Christmas would not be Christmas without this film! My favourite Christmas movie….Bad Santa! Many people forget that Die Hard is a Christmas Film – and it’s my favourite. My favourite christmas film is miracle on 34th st-the old version. It is so poignant and christmassy. I have watched it over and over again and I am 58 now!!! Jingle all the way is my favourite film. Jack Frost..I have seen it a million times, yet I always have a good old cry! My favourite is ‘Scrooge’ (A Christmas Carol) from 1951 with Alistair Sim – it isn’t Christmas without it! Miracle on 34th Street… the original and the remake! The wonderful wizard of oz.the whole family singing the songs and picking there characters. A Child’s Christmas in Wales! It is my all-time favorite Christmas movie! My favourite film is “A Christmas Story” – it’s not as well known, but I highly recommend it. It’s set in 1940’s America, and it’s a sweet, sentimental, laugh out loud story of a young boy who wants a BB gun for Christmas. My fav film is Elf!! Because it is hillarious and gets me giggling and I forget about the stresses of Christmas! My favourite Christmas film has to be Home Alone – Christmas is just no the same without it !! The Lion King as I remember many happy years watching it with my two girls who are now watching it with their children. It it about the circle of life and very poignant in so many ways. Simply the best Disney animation for both adults and children alike. My favourite Christmas film is Jingle All The Way – It reminds me that it’s not just me that ends up traipsing round the shops in search of the years ‘must have’ toy! My favourite film from my childhood is A Miracle on 34th Street because of the whole, is he or isn’t he real. However, my all time favourite is, It’s a Wonderful Life, because it sums up Christmas to T.
Has to be Home Alone – it never gets old! My favourite Christmas film is A Muppets Christmas Carol because it makes me and my son laugh and it was the first Christmas movie we watched together, so it has sentimental value as well. I have to say Love Actually, I can watch it over and over again. And I like hearing Billy Mack’s Christmas Is All Around on the radio, it always makes me smile. Miracle on 34th Street is my fave Christmas movie cuz it reminds me that Christmas is believing that dreams can be real! Miracles can happen if you have faith! I love Santa cuz he just saves Christmas Day! Home Alone – still makes me laugh! Elf is the best xmas film ever, Buddy is so loveable and funny we all secretly wish we could all be so easy going and happy hearted.He makes all my family smile. It has to be Scrooge with Alistair Sim, an absolute classic! Muppet Christmas Carol. It’s just not Christmas without it, even though I am 42! You really can’t beat the original Home Alone movie, as a kid you really wished you could do all that stuff especially “keep the change you filthy animal!” — fantastic! As you get older you start to see all the hidden meanings and it makes you feel warm inside by the ending, really gets you into the Christmas spirit. I have 2 favourites.. Elf and miracle on 34th street! The Muppet Christmas Carol. The best Christmas film ever. Muppet Christmas Carol. Easy to watch family fav!! My favourite Christmas film is ‘Falling in Love’ starring Meryll Streep and Robert de Nero. It starts on Christmas Eve when two married strangers get their purchases mixed up in a book shop. And it inevitably leads to love.. wonderfully romantic and makes you want to go to New York, NOW! Home Alone ))) It`s so funny! It`s the best christmas film from my childhood!! Home Alone! It`s so funny! It`s the best Christmas film from my childhood!!! I love Elf, I can watch it over and over, it always makes me cry as well as laugh. Perhaps it’s because I know a few men who are just like a few of the characters,or perhaps its because I’m still a kid at heart. It has to be Elf for me, doesn’t matter how many times I watch it, it always makes me smile. I love the Disney Christmas Carol and watching that with my children always gets us in the mood for a happy Christmas. I love home Alone, always makes me laugh! Elf – I know it’s a children’s film but I roar with laughter at it. My favourite Christmas Film is ‘The Snowman’ a film of the Raymond Briggs classic tale. The sheer beauty of the animation and the lovely music are just enchanting for both children and adults alike. Makes me make all sorts of Christmas wishes!!! And promise to be good for the rest of the following year! The Polar Express. Love snuggling down with a hot chocolate and cookies to watch this lovely movie. Its a wonderful life-love it and makes me get into the festive season. Goodnight Mr Tom – not necessarily as festive as the others but compulsory during the christmas season. Miracle on 34th St as it convinced me there really was such a thin as Santa. My favourite Christmas film has to be scrooged starring Bill Murray. Great, funny version of a classic story. Got to love the ghosts too, crazy taxi driver and a mad fairy. The Grinch who stole Christmas – fab characters, nice moral to the story, what more could you want? My favourite film is A Christmas Carol – even though I know the story inside out, I still start out thinking what a miserable s*d Scrooge is, feel sorry for him and then feel happy at the ending. I know it’s Christmas when I’ve seen it. I love Charles Dickens’ “A Christmas Carol” – it tells a real story, and is full of pathos and drama. My favourite christmas film is Miracle on 34th Street. It gets me in the mood for christmas and just makes me want to put christmas decorations up and drink hot chocolate by the fire. I love how the film makes you believe in the spirit of christmas. My favourite Christmas film is The Nightmare Before Christmas – just the most original animation possible and watching the Halloween world people try to get to grips with Christmas always entertains and uplifts me. My favourite film is Home alone,never get bored of it. Love Actually. Pretty romantic actually. Pretty festive actually. Pretty humbling actually. I love Love Actually. My fave film is the grinch! Yes Virginia There Is A Santa Claus is one of my favourites. The film being in black and white is a definite bonus. The film is based on a true story and I think it brings home the true meaning of Christmas. Elf is a great family movie with loads of laughs for everyone! Jingle All the way! How I wish Arnie was my dad, what a legend. Always wanted a turboman when I was younger, never got one. Arnie would of got me one! “Home Alone” – Just because it’s genius. The Muppets Christmas Carol. You have the zany and witty Muppets jumping around everywhere, whilst the acomplished Micheal Caine holds the movie together with a sterling performance in the face a=of adversity. Brilliant stuff. I love ‘The Nativity’ with Marc Wootton and Martin Freeman. It has all the christmas elements with humour that is just on my wavelength. Mr Poppy is so kind and funny and is just the big kid we all wish we were. The line Martin says to Mr Shakespear about their nativity being made into a Film and ‘a book!’ with his straight face is priceless. Love it!!!! My favourite has to be ‘The Snowman,’ never gets old! I used to cry as a child when the snowman melts at the end. Then there’s the iconic song! I couldn’t believe it when I found out the small boy who sang it is now in his 40’s! my fav film is Santa Claus the Movie with Dudley moore, no matter how old i get it still seems magical! It’s going to have to be Elf, we watch it every year and it’s been a tradition since it was released! Not the most creative but I love ‘love actually’ I could watch it everyday! My favourite xmas film is ELF cos I’, a cotton headed ninny muggins who rolls on the couch with laughter at his antics, it really gets me in the mood for crimbo. My favourite Christmas film is “A Christmas story” because I love that the film was based on my hometown of Cleveland, Ohio. It reminds me of being back in the USA with my family. It makes me laugh every time I see it. y favourite Christmas film is Elf, it makes me feel so festive and it’s a great laugh. my favourite christmas film is the holiday I love watching romantic movies 🙂 love a happy ending ! I love the Muppets christmas carol. Makes me smile! Muppets Christmas Carol – it never stops being funny and love it every year! My favourite film is Home Alone. Its one of the few films I can enjoy watching every year. I think its probably as I had a lovely time watching it with the kids when small and it is associated wit a lovely time. It’s a Wonderful Life is the most magical Christmas film ever! It’s been my favourite film since I first saw it when I was 9(I’m now 53), every time I watch it it’s like the first time all over again. Home Alone is my all time fave – just a good family laugh! My favourite movie is The Nightmare Before Christmas as I love all Tim Burton’s films and this one is perfect as it is usually on sometime during the run in. I love the film Elf when he dresses up the department store overnight. Always makes me smile. My favourite Christmas movie is always a Christmas Carol but the really old version. It has more magic than todays movies, I love the story as it has a great message we can all do with remembering. Be kind, considerate, appreciate what we have and share with others! My favourite Christmas film is definitely ‘The Santa Clause’. I remember watching it over and over when I was little, It’s such a funny and heart warming movie. My favourite part is when he first visits the north pole, and the head elf Bernard tells him he is now Santa Claus. Makes me smile every time! My all time Christmas film is It’s a Wonderful life. I have such found memories of watching it with my lovely Grandma. Gremlins. It’s festive, hilarious and has the gorgeous Gizmo for the aww factor and plenty of blood and guts. Perfect! The Muppet Christmas Carol! I love the Muppets at the best of times and a Christmas Muppet movie is just unbeatable! Nothing, but nothing, beats Brief Encounter, perfect any time of any day of any year when you’re with the one you love and you don’t mind if anyone sees you crying. The greatest British film ever, even better at this time of year. The christmas shoes, about a young boy that mom his dying and saves hard to buy his mom these special shoes before she dies, not miserable. My favourite film to watch at christmas has to be Bridget Jones Diary, its so cosy, silly, and who doesnt want to see her in those granny knickers. Muppets Christmas Carol. Can’t beat a good muppet at Christmas! I used to love the muppets as a kid, so it has to be the Muppets Christmas Carol. My favourite Christmas film is Miracle on 34th Street. Cute little girl, Gorgeous boyfriend, real looking Santa and in the end everyone believes in Santa because kid is clever. Happy Ending ! The Polar Express, when all of the waiters do the dance on the train.It’s brilliant! Its a wind in the willows film called Mole’s Christmas…because my surname is mul(mole)rooney we watched it as children growing up!! White Christmas – I love all the old musicals & you can’t beat a bit of Bing at Christmas! Love Actually – it has everything, a teenage Kiera pretending to be old enough to marry, Bill Nighy in customised denim singing wet wet wet, the dodgy end of Wandsworth, Hugh Grant running our country and a little boy flouting Airport security for the sake of love. Oh and it is wickedly festive and British! Mine is “Love Actually”, it’s just perfect to watch late on Christmas eve while you’re wrapping the last presents. I love Die Hard, the action, comedy and of course Bruce Willis making his wisecracks. I love Home Alone, such good family fun it’s become a tradition to watch it at least once over the holidays. Good memory making days. My favourite xmas film is Planes, Trains and Automobiles where John Candy follows Steve martin up the wall which is very funny, but in the end they are best of pals. My fave xmas film is The Polar Express, i love it and it makes me feel all cosy when i watch it. My favourite is Home Alone – something about two burglers & an abandoned child is heartwarming & feels like a Christmas tradition! I love Arthur Christmas (the film, this is not a statement to upset my husband, honestly!). It’s a great, feelgood kids film which keeps us all laughing. It’s lovely to find out that even Father Christmas has problems with his family….!!! I used to watch a film every Christmas from as young as I can remember to when I was 12, but I lost it and could not remember the name of the film. Only last year at the age of 39 years old did I stumble on a clip of it. It is called “It’s a wonderful life” and life is wonderful isn’t it. Christmas carol- reminds us all that christmas is for giving all year round. Scrooge with the sinister Alistair Sim just perfect for the part. My favourite Christmas film is Dumb and Dumber. Miracle on 34th Street-I love it! I love Mickey’s Christmas Movie – the bit where they both sell belongings to buy each other presents gives me a lump in the throat everytime. It could only be home alone. Absolute classic film. My Fave Christmas film is home alone you can’t beat the faces of Joe Pesci and Daniel Stern when getting bettered by a kid. I love Home Alone. Simply hilarious! My children love it too. Belly laughs all round. Winnie the pooh and christmas too. It was watched endlessly at Christmas when the children were smaller, and it takes me straight back to those wonderful times. Home alone definitely! I watch it every year, never fails to make me smile! My favourite Christmas film is jingle all the way! It reminds me so much of the furby craze when I was younger. All I wanted was a furby for Christmas and Mum often tells me the story of her panic searching everywhere she could to find they were out of stock everywhere. She finally got her hands on one when it was Christmas Eve! So whenever I watch poor Arnie search for the turbo man doll it makes me think of the year of the furby and Mums story. I Love Polar Express. It has a beautiful story with memorable music and voice acting. If I would describe The Polar Express in one word it would be beautiful. Home Alone. I remember us all watching it as a family when I was a kid! My favourite Christmas film is Elf. about the Santa’s elves who learns he’s human and goes to New York to find his biological father. I love how he causes havoc but also think that it is a very touching film. Home Alone – a quite often forgotten xmas film! Has to be Home Alone, so funny. My favourite Christmas film is muppets Christmas carol, so many years of great memories. Nothing makes me feel more Christmassy than sitting down to watch Elf with the family! It was the first movie that my Daughter sat and watch in its entirety when she was 2. It’s funny, clever and is filled with Christmas Joy! Elf. It’s so funny I cry laughing watching it. My fave Christmas film has to be Elf – Buddy is the Elf that I’d pick as a BFF if I had the choice, he’s a funny and fun guy who’s sensitive too and he’s always part of our Christmas tradition… Putting up the tree, supper, followed by drinks and nibbles with Elf! I love Elf…It makes me feel like a kid again! The film Scrooged is my favourite. For laughs we love ‘The Santa Claus’ we just watched it this afternoon and will follow it up soon with 2 & 3. For our very best weepy, family tradition, we love to watch ‘It’s a Wonderful Life’ every Xmas Eve. Thanks! National Lampoon’s Christmas Vacation – it has everything. Problems decorating, family turning up unexpectedly, all sorts going wrong and it’s so bloody funny! Of course all turns out well in the end. I can’t choose a favourite bit but when grandma’s wrapped up her own cat as a present it’s brilliant. I remember going to see Home Alone as a child. Still love to watch it every Christmas now. Home Alone, still funny now after all these years! I love Elf and the scene where he decorates the department store over night. Always makes me smile. Love the Wizard of Oz with Judy Garland….can just lose yourself in this film whatever your age!